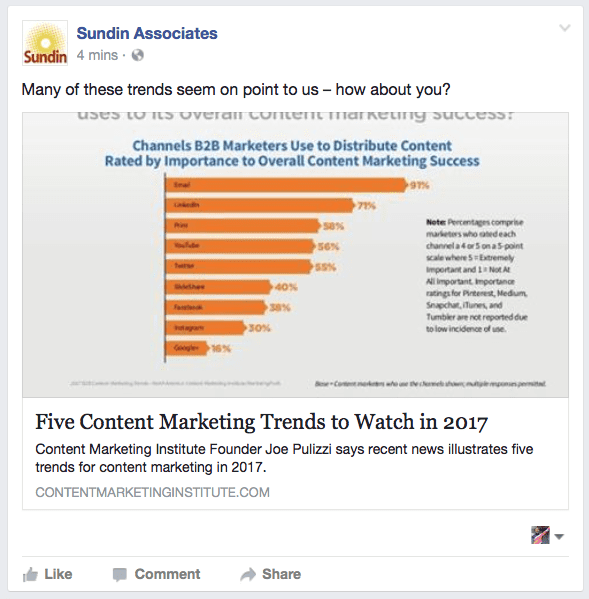 Why I’m done with curated content – Sundin Associates, Inc. I have come to the conclusion that curated content is the social media equivalent of some energy bars – it will fill you up, but will do very little to help you in the long-term. Which is why, for the most part, I am done with curated content. For those just catching up. . . Curated content – links, articles, videos, and other items which are gathered and shared to channels such as Facebook – is a mainstay of most social and content marketing strategies, and it’s easy to see why. Content on any topic is readily available and it’s free. But like those energy bars, it does little more than fill your social media channels. It doesn’t drive traffic to your site. It doesn’t raise awareness of your name, your products, your people, or your involvement in the community. It doesn’t encourage conversation or inspire people to share. It doesn’t establish thought leadership or differentiate your organization from competitors. One could argue that by sharing this article, I am illustrating that we are keeping up to speed on current trends (Look! We’ve read websites and articles of interest! ), as well as our commitment to helping our clients and followers do the same. But even with the invitation to engage in conversation, I predict we will see little activity on this post. Instead, it will momentarily fill our Facebook feed, without driving traffic to our website or give me any content for our email newsletter. And, it’s not actually free because it takes time, perhaps less time than other forms of content, to research and schedule – which ultimately could be the most dangerous side effect of relying on curated content. If we are unable to demonstrate the impact on an organization’s strategic objectives, we risk having to explain why it’s worth spending resources (time and/or money) on a social media strategy. Instead of spending time on curating content from outside sources, I prefer to look inwards to find content that has already been created – for example, press releases, newsletter articles, commercials, job opportunities, frequently asked questions, informational videos, how-to’s and seminar & webinar recaps – which can be readily distributed through additional channels. 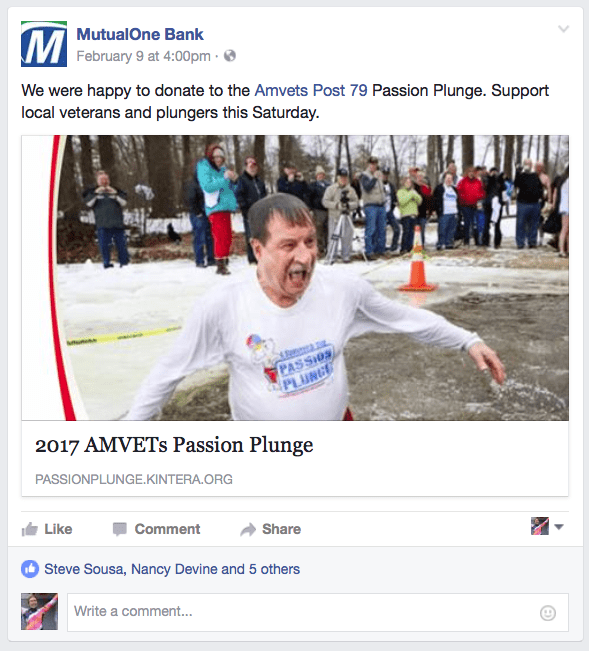 A press release, posted to the Bank’s website, can then be shared to social channels as well as in an email newsletter. Does that mean there is no place for curated content? No, but to return to my energy bar analogy, curated content should be used in small doses, to help boost your efforts. By spending time curating links that support your activities – newspaper articles, video interviews, sponsored events links and community partners – you will develop a healthy, balanced (content) diet. 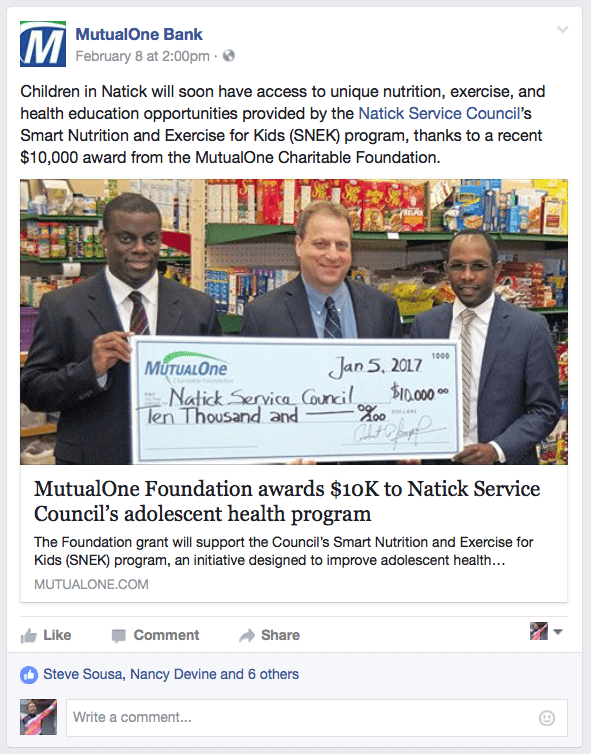 A link to a community partner raises awareness of both the upcoming event, and the Bank’s support.